Making a viking knit bracelet is pretty easy, once you’ve got a handle on the directions for viking knit. 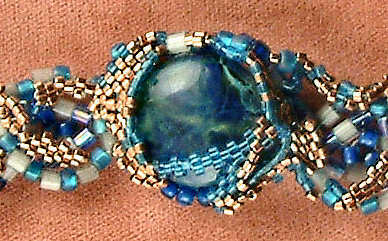 Now that you’ve got that more or less mastered, a bracelet is a good first project. But before we get to making that bracelet, let’s talk a minute about the wire you’ll be using for your viking knit. There are two gauges of wire commonly used with viking knit — gauges 24 and 26. Occasionally gauges 22 and 28 are used, but they are a little more difficult to deal with, at least at first. What Kind of Wire for a Bracelet? If you’re just starting out, I suggest copper wire in 24 gauge. 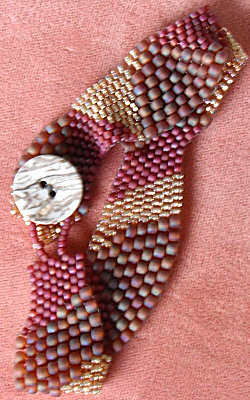 It’s inexpensive, easy to find and makes a very pretty viking knit bracelet in either single or double knit. My next suggestion would be brass wire. It’s a little stiffer to manipulate than copper, but still makes for a nice piece of jewelry. My third suggestion for just starting out would be one of the colored artistic wires — basically enamel coated copper. Why is this my 3rd choice? 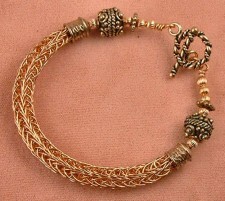 The artistic wire can scratch very easily in the course of making the viking knit chain. If the color is light and shiny, the scratches might not be very apparent. But for a darker color, you will eventually notice the wearing away of the colored coating. So if you go the artistic wire route, choose a bright shiny (metallic-looking) color and you will probably be OK. And after I said all that, I do use artistic wire for seasonal jewelry (red and green for Christmas, metallic pastels for Spring, etc.). I just don’t use it for bracelets I plan to wear day in, day out. Naturally, you can use silver (fine, sterling, argentium) or gold (karat or gold-filled) wire; they make beautiful bracelets! But they are best reserved for when you are more experienced. That takes care of the wire you’ll need for your bracelet. Stay tuned for the draw plate information!